In 1905, Einstein’s comparison between dim (or dilute) light, and an ideal (dilute) gas led him to conclude that under certain conditions, light will behave as a particle. 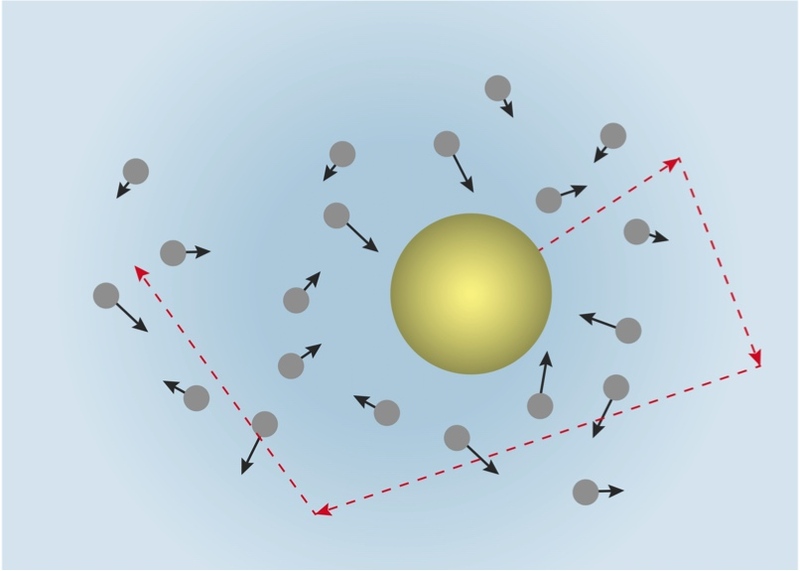 The photoelectric effect is a result of electron-photon pair collisions. In 1887 Hertz confirmed the wave nature of light and also (inadvertently) its particle (photon) nature as well. In 1905, at the age of 26, Einstein published four major papers and finished his PhD thesis. Each of these papers was groundbreaking and would change physics forever. With his work in 1916-7, Einstein was able to arrive at a “much more” quantum derivation of Planck’s Radiation Law. However, in the end he fell short, having to rely on assumptions. In 1924, Satyendra Nath Bose provided the first “fully” quantum derivation of Planck’s radiation law, which revealed the deeper nature of light that had eluded everyone else, including Einstein. With this work, he created the new area of physics known as quantum statistics. In 1905, a young Albert Einstein wrote a paper (while working as a patent clerk) on a well-known physical phenomenon of the time, Brownian motion, which had first been noted in 1827. Einstein’s theory correctly described Brownian motion, and at the heart of his theory was the existence of atoms that were in constant motion. Both electrons and X-rays diffract as waves off of crystals. To be sure, Einstein is being acknowledge for the “the law of the photoelectric effect”, in other words for his photoelectric equation, but not for the photon concept. This attitude would persist until 1923, when new experimental results would convert pretty much everyone to the existence of photons. A person can often hear a sound from farther away better when the temperature is colder outside. The transition from quantum theory to quantum mechanics began in 1926 with work of Erwin Schrödinger. The atom concept has its origins in Ancient Greek debates over the nature of change and permanency. Your car runs more efficiently when it’s colder outside. During his formal education Sadi Carnot (1796-1832) was literally surrounded by renowned physicist, chemists and mathematicians on the faculty. However, Carnot was never a member of this distinguished group, and did his most important work (as a founder of modern day thermodynamics) as an outsider. Joule and Mayer’s work (mid-1800s) provided the clear relationship between heat and work; the mechanical equivalent of heat. The zero point energy of a system is a direct consequence of the Heisenberg uncertainty principle. A major stumbling block to Dalton’s success was his poor experimental technique. Although it has no overall charge, a neutron still has a magnetic moment. Quantum probability is a natural consequence of Schrödinger’s formulation; Heisenberg’s includes it explicitly. In terms of quantum theory, increasing the intensity of light means increasing the number of photons. In 1923, Arthur Compton’s (1892-1962) light scattering experiments provided further support for Einstein’s hypothesis for the particle nature of light. Although possible, helium does not easily solidify due to quantum effects related to its small atomic size. The probabilistic interpretation of quantum mechanics is due to Max Born. Ice is one of very few solids that melts when pressure is applied; example: ice skating. Shorter wavelength blue light is scattered more by air molecules than red light. It’s this “Rayleigh scattering” that results in the blue color of the sky. Only a single fluid exists at the liquid-vapor critical point; it exhibits properties of both phases. When a liquid has been heated to a temperature above its boiling but still doesn’t boil, it’s superheated. If a liquid is cool rapidly enough it can miss the freezing point and end up as a supercooled liquid. While all glasses are amorphous solids, not all amorphous solids are glasses; glasses exhibit an actual glass transition. Even though we say solid, a glass is actually a very viscous liquid that moves very slowly over time. Unlike the crystal an amorphous solid or glass is a disorder arrangement of the atoms of the condensed phase. At some temperature a supercooled liquid transitions to a more solid or condensed form; this is the glass transition temperature. The glass in a window (for example) is really a very viscous liquid that moves very slowly over time. A light bulb is more likely to burn out when first turned on since this is when the electrical resistance is the lowest. As the current flows it heats up the wire and the atoms begin to “jiggle”, which increases the electrical resistance. The constant k in Boltzmann’s equation for entropy (S = k ln W) is called Boltzmann’s constant, but it was Planck who actually introduced it. In gases like air, sound travels via collisions with the molecules; sound travels faster in gases when the temperature is increased (and the density is held constant). Sound travels faster in air as the temperature increases. At the microscopic level entropy is intimately connected to the motion of atoms. The speed of sound depends on the phase of the material (solid, liquid, or gas). In general, sound travels fastest in solids, then liquids, then gases. The atomic theory of Dalton was fatally flawed by his belief that the same atoms couldn’t combine. Temperature is a measure of the average translational kinetic energy a single molecule in a given system possesses. Michael Faraday’s experiments in the 1830s provided an initial “peek” at the electrons inside the atom. Einstein’s light quanta hypothesis met with tremendous resistance, taking almost twenty years after its introduction in 1905 to be fully accepted. Despite such opposition, Einstein continued to use the concept in his work with significant success. 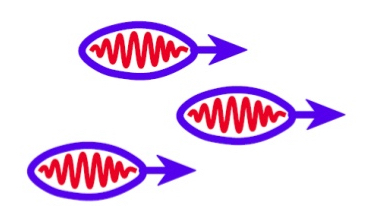 The atoms of a Bose-Einstein fluid are in the exact same quantum state. A laser is possible because photons are Bosons and not Fermions. Aristotle criticized Democritus‘ atomic theory, which both hindered its acceptance and provided the majority of what we know about it. If the wavelength of visible light was as large as that of a sound wave you’d be able to see around corners. Democritus saw material objects (matter) as existing in a temporary state, being created or destroyed as atoms respectively come together or fall apart under the influence of natural forces; all that remains then are the atoms comprising those material objects. Democritus considers everything in the universe – including the human mind and soul, and even the gods – to be comprised of atomos, which is Greek for indivisible and from which we get “atom”. With a firm belief in atoms, impressive physical insight and armed with a few simple rules, Dalton was able to construct a table of relative weights, which he first presented in 1803 at a talk to the Literary and Philosophical Society of Manchester. In 1805, this effort first appeared in print, with a systematic explanation of the method appearing in 1808 when Dalton published the first volume of his book A New System of Chemical Philosophy. Here, with hydrogen as his reference, he gave the following relative weights: hydrogen (H) 1; nitrogen (N) 5; carbon (C) 5.4; oxygen (O) 7; phosphorus (P) 9; sulfur (S) 13 and so on, including several elements and compounds. Modern atomic theory began in 1808 when Dalton published A New System of Chemical Philosophy. Newton felt there were some properties a wave theory of light simply could not explain, such as diffraction. For example, diffraction is the property of waves that allow them to bend around objects and spread through openings. In the case of sound waves, it’s why a sound in one room can often be heard in another room farther away by someone not directly in the path of the oncoming sound; the sound wave travels from the one room, spreading out through the doorway into the other room where it’s then heard. Light doesn’t appear to behave this way, after all, you can’t see around corners – can you? The diffraction of light is usually unnoticeable because light waves have such short wavelengths – much smaller compared to the wavelengths of sound waves. Nonetheless, light will diffract if the opening is small enough. The speed of light was measured as early as 1862 by Leon Foucault giving good agreement with the modern value of 299,792.458 Km/s. In 1666, Newton bought his first prism with the motivation of disproving Descartes wave theory of light. In 1913, Bohr envisioned the quantum atom where electrons jump between orbits absorbing/emitting photons. 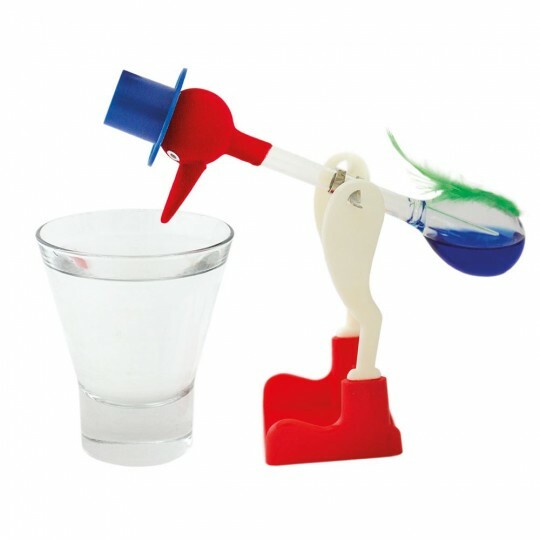 The drinking bird is a nice example of a heat engine. The evaporation of water at the bird’s beak results in a cooler temperature there than at its base (around the tail feather). In turn, this temperature difference causes a pressure difference (high to low from base to beak) that causes the (very volatile) liquid to rise up, eventually toppling the bird forward causing it to “drink”. Cooling soup by blowing on a spoonful prior to placing it in your mouth works because the hotter atoms are literally blown away. This is because the soup is made up of atoms comprised of a range of speeds. The atoms with the higher speeds – the hotter ones – are on top, hovering above the atoms with the lower speeds – the cooler ones. So, the end result of blowing on the spoonful of soup is that the hotter atoms are blown away, while the cooler ones are left behind. Maxwell constructed a theory that showed Saturn’s rings couldn’t be solid, liquid or gas, but rather were made of many small, solid, colliding particles orbiting the planet, which were dynamically stable and provided a solid-like appearance; the solution won him the prize. Today, we do know that Saturn’s rings are comprised of tiny rocks that collide with each other as they orbit the planet. In is interesting to note that what led Maxwell to kinetic theory was, oddly enough, Saturn’s rings. The story of Galileo dropping objects from the Tower of Pisa probably never happened. By mid-1609, Galileo was working on his treatise about the science of motion, when upon hearing of the invention of the spyglass (the precursor to the telescope) he dropped everything to make his own version. By the end of August, Galileo had a 9X telescope. Around December 1, 1609, Galileo had in his possession a 20X telescope, allowing him to observe the moon’s rough mountainous surface, four (of the currently sixty-seven known) moons of Jupiter, and several new stars. Galileo‘s interest in pendulum motion may have started in 1583 upon noticing the motion of a swinging chandelier in a cathedral in Pisa. While a professor at Pisa, Galileo‘s criticism of Aristotle‘s physics managed to offend the philosophy professors. In 1589, Galileo became professor at the University of Pisa making half of his predecessor’s final salary. The atomic weight of a mid-sized atom is around 0.00000000000000000000001 grams; a 1/400th of an inch grain of sand weighs about 0.001 grams. Earth’s atmosphere is 78.09% nitrogen, 20.95% oxygen, 0.93% argon, 0.039% carbon dioxide, and small amounts of other gases. Newton‘s alchemy studies began around 1669 and continued for some 30 years. His alchemical manuscripts total well over million words. The notion that the universe runs like a mechanical clock arose in the 17th century leading to the mechanical philosophy. The Ancient Greek alchemists sought to make gold and silver from “lesser” metals. The Chinese alchemists sought elixirs for longevity, immortality, and the perfection of the human soul. While Newton saw the world as following definite laws, he also imagined an intervening God to keep things running smoothly. Descartes saw no difference between man-made machines and nature’s “machines”, other than the former had to be big enough to see. Galileo was an accomplished lute player and often played duets with his father. Galileo designed a powerful telescope (20X) by 1609 allowing him to see the moon, 4 (of 67) moons of Jupiter and several new stars. In mid-1609 Galileo turned his focus away from the laws of motion and pointed his telescope towards the sky. Galileo put his original work on the laws of motion on hold for 25 years to focus on his passion with astronomy. A pendulum goes to and fro in the same amount of time regardless of how big the swings are – only when the swings are small. Although he bragged of having designed one, Galileo never made a pendulum clock. His son did after Galileo died. In other words, as the temperature is lowered, the atoms in the gas begin to “pile up” or condense into the lowest (single particle) energy state, which is the one with zero kinetic energy; there’s a critical temperature whereby a phase transition (now called (Bose-Einstein condensation) occurs. This effect becomes most pronounced as the temperature is lowered to absolute zero, at which point, all the gas atoms condense into this lowest energy state. This phenomenon is an example of quantum entanglement. Hints of energy being conserved, much like momentum, were showing up by the 1840s. But unlike momentum conservation, which by comparison was quickly accepted and understood (pretty much by 1687 with Newton’s Principia), energy conservation remained a mystery until 1850. In 1798, while boring holes into cannon barrels (as part of the manufacturing process), Count Rumford concluded that heat was the result of some sort of motion within objects. In 1644, in his Principles of Philosophy, René Descartes (1596-1650) proposed that the total motion of the universe is conserved. While this conservation of motion concept bears a certain similarity with Newton’s conservation of momentum, it’s still wrong. An object in free fall was too fast for Galileo to accurately measure, so he focused on the slower motion down an inclined plane. Proposed in 1811, Avogadro’s Hypothesis only began to gain acceptance in 1858 (two years after his death) thanks to Stanislao Cannizzaro. Einstein‘s doctoral thesis was entitled: On A New Determination of Molecular Dimensions. Extensions of this effort lead to his famous paper on Brownian motion in 1905, which helped to solidified the existence of atoms. In 1909, Jean Baptiste Perrin provided the first accurate experimental determination of Avogadro’s number. Unhappy with his arrangement at University of Padua, Galileo managed to strike a new deal in 1610 whereby he became “Chief Mathematician of the University of Pisa and Philosopher and Mathematician to the Grand Duke of Tuscany”. The appointment was for life and he wasn’t obligated to teach at the university. He also wasn’t required to reside in Pisa, which allowed him to finally return to his beloved Florence. In 1599, Galileo acquired a large house with a garden and vineyard. Here he housed students who stayed with him for extended periods (along with their servants), and maintained a workshop (complete with a coppersmith) for the manufacture of instruments. The private lessons he gave along with his university courses kept Galileo very busy. In 1905, Einstein said light is a particle (photon) with energy proportional to its frequency. Although photon momentum was known much earlier to Einstein, he waited until 1916 to finally declare it. Galileo’s natural music ability helped him measure time in his experiments with the inclined plane. Einstein predicted a new phase transition for matter (Bose-Einstein Condensation) in 1925; it took until 1995 to verify it experimentally. Einstein predicted stimulated emission can occur when light and matter interact; this idea forms the basis of the modern laser. Despite the various subatomic particles comprising an atom, only its outermost electrons are involved in chemical reactions.